Lal Lal is a rural township on the Geelong to Ballarat railway and 20 km south-east of Ballarat. It was named after the Lal Lal pastoral run (1845), and the name is thought to be derived from an Aboriginal expression describing the nearby falls on the Lal Lal Creek, a tributary of the Moorabool River. Lal Lal is situated in flat country with ranges rising to its east. In the 1860s it had pastoral and timber-cutting activities, and the opening of the railway line (1862) brought additional population and upwards of four hotels. A school was opened in 1866, and the present building dates from 1875. To the south-east of Lal Lal there was the Mount Doran, Dollys Creek and Morrisons gold diggings, and a dam was constructed on the Lal Lal Creek in 1863 to supply water to those places. In 1874 the Lal Lal Iron Company was formed to mine and process iron ore which had been found nearby. 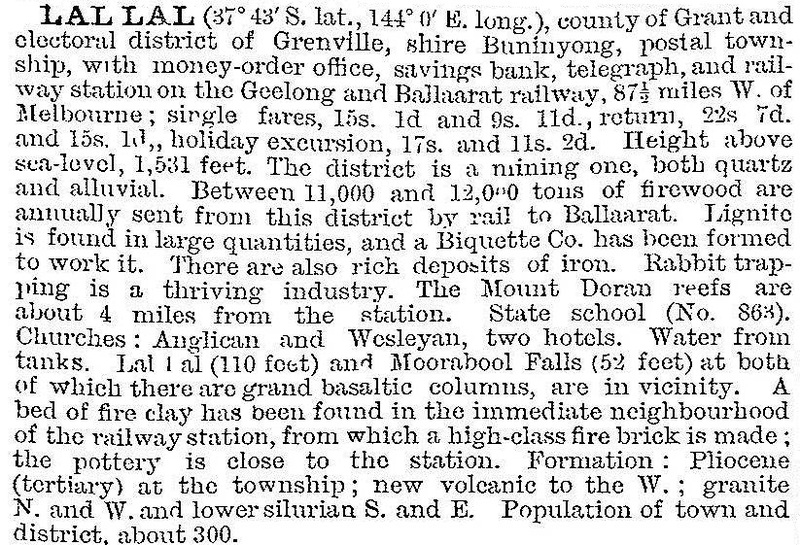 There was a strong market for pig iron at Ballarat’s foundries which had large public works contracts and an expanding domestic market. The Lal Lal smelter was opened in 1875. It was replaced by a larger unit in 1880 and was in continuous production until 1891 when cheap pig iron, transported as ships’ ballast from Britain, caused its closure. The smelter and a surrounding reserve are historically important and are on the Register of the National Estate. There was also a racecourse (1873-1938) near the falls. Between 1913 and the 1950s there were several attempts or exploratory plans to make bricks from the local clay and coal products from the lignite, but the products were either inferior or did not eventuate. The Lal Lal Falls have been the most enduring local feature (although intermittently reduced to a trickle), and the racecourse reserve has been changed to a public area for visitors. About 400 metres east of the smelter is the Lal Lal reservoir. In 1914 a Catholic church building was moved from Lethbridge to Lal Lal and was used for worship until the late 1950s. Lal Lal has a school (34 pupils, 2014), the Lal Lal Falls hotel, a public hall, the falls and blast furnace reserves, and a disused railway station and water tank (1863) which are on the Australian and Victorian heritage registers.